The Tigers started this afternoon's game as though breakfast hadn't quite settled. The Austin Peay Governors were the sharper team just after the noon tip-off, taking an 8-3 lead and holding a 10-8 advantage at the first media timeout, 4:16 into the contest. Then Geron Johnson entered the game. Over a two minute stretch, the junior guard snatched a defensive rebound to start a fast break, delivered an alley-oop pass to D.J. Stephens for an emphatic dunk, and grabbed an offensive rebound that he converted into two points off the glass for a 16-10 Tiger lead. The game, for all intents and purposes, was already over. "[Geron] always brings good energy, at the offensive and defensive ends," said freshman forward Shaq Goodwin, who was limited to four points but grabbed eight rebounds, dished out five assists and had four steals. Goodwin and Johnson connected for the play of the game early in the second half. Grabbing one of those steals, Goodwin lobbed the ball from well behind midcourt, over the head of Johnson as the junior guard sprinted the other way. The ball bounced within a few feet of the basket before Johnson grabbed it in midflight and softly delivered the ball off the glass and into the hoop. The Johnson show also included a pair of steals — one in the Austin Peay backcourt, the other in the paint on the Tigers' defensive end — sandwiched around a dunk. His final stat line for the fifth game of his college career: 14 points, 7 rebounds, 6 assists, and 4 steals in 28 minutes off the bench. "I'm comfortable, but there's a lot more work I can do," said Johnson after the game. "We should see some more things. In junior college, I turned the ball over too much. I had three tonight, and that's not good. It's all about ball pressure, and staying conditioned. Guarding Joe Jackson in practice . . . that's tough." Junior center Tarik Black again came off the bench, now two games after a one-game suspension for violating team rules in practice. He led the home team with 18 points but uncharacteristically missed five field-goal attempts, including a few layups. Jackson scored 12 points, but had six of the Tigers' 23 turnovers. Antonio Barton added 10 points off the bench and senior D.J. Stephens brought his typical energy boost with 10 points and 9 rebounds in 18 minutes. Stephens blocked a shot so emphatically in the second half that the slap could be heard on press row. Overall, the Tiger bench outscored Austin Peay's, 57-7. Memphis coach Josh Pastner emphasized that every win is a good win, but noted the turnovers and Austin Peay's field-goal percentage (50 percent from the field, 75 percent from three-point range) as worthy of concern. "We were trying to play so fast, [the turnovers] just happened," said Goodwin. "They weren't forced. We'll start working on that Monday." "Our defensive intensity and pressure was really good," said Pastner. "We gotta take care of the ball better, though. There was really no flow to the game, up and down." Pastner nodded to his team's most obvious energy source for a second straight game. "Geron's a high-motor guy," said the coach. "I'm wired as a human being; an energy giver. When I see guys wired like that, it gives me more pep in my step. It's contagious. It's a really positive thing." The Tigers now have a full week to prepare for 5th-ranked Louisville, the program's preeminent historical rival. The Cardinals will play at FedExForum next Saturday for the first time in more than seven years. "We're calling for a blue-out next Saturday," said Pastner. "The whole reason this game is happening is for the fans. It's a give-back to the fans, after all they've done for us. I have great respect for Coach [Rick] Pitino. He was our biggest advocate for getting us into the Big East. They're a tremendous program." NOTES: • Tiger forward Adonis Thomas left the game after just four minutes when he was hit in the eye by a stray elbow from Austin Peay's Chris Horton. (A flagrant-one technical was called on the play, meaning the act was judged intentional but not worthy of ejection.) Pastner said Thomas suffered a cut to one of his eyelids and actually his eyeball, resulting in blurred vision. Tiger trainer Brad Anderson said Thomas could play if needed, but he remained on the bench for precautionary reasons and is seeing an eye doctor this afternoon. • Governors guard Travis Betran played a tremendous game, hitting 9 of 15 shots (including five of six from long range) for a game-high 27 points. 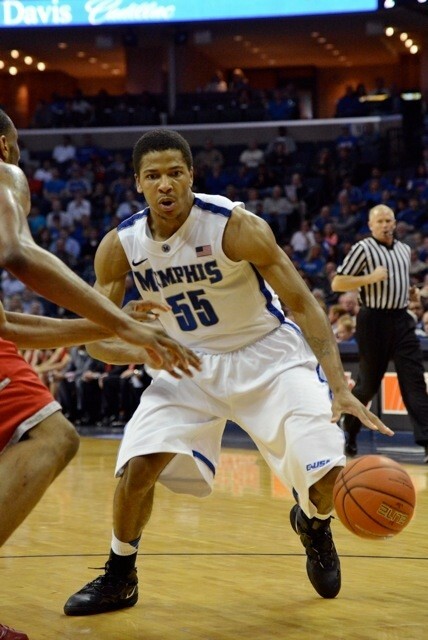 • Memphis had five players with at least three turnovers: Jackson, Goodwin, Johnson, Black, and Chris Crawford.